“Active Resource” means a profile of an individual (e.g., employee, contractor, freelancer, or partner) on the Platform. “Client Data” means all data and other content provided by Client to Axio in connection with using the Services. “Platform” means the platform provided by Axio to Client to view and analyze Client Data, including all software, interfaces, tools, utilities, templates, forms, and other technologies (and any related intellectual property) relating thereto, excluding Client Data. “Services” means the Platform and any other services provided by Axio hereunder. 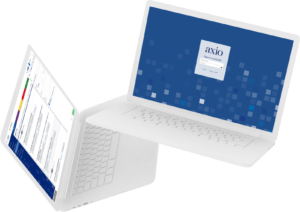 Subject to the terms and conditions of this Agreement, Axio grants Client a non­exclusive license to use and access the Platform solely for Client’s internal business purposes. 2.2 Access and Account Setup. Axio will provide Client with access privileges that permit Client to access and manage the Platform and access Client Data and other related data. Client shall be responsible for the acts or omissions of any person who accesses the Platform using passwords or access procedures provided to or created by Client. Client will be responsible for entering Active Resource information and Client Data into the Platform. Client shall have the ability to add, modify or delete Active Resources from the Platform. Client hereby grants Axio a worldwide, non­exclusive, royalty­free license to use, copy, access, process, reproduce, perform, display, modify, distribute and transmit the Client Data on the Platform and in connection providing the Services to Client. Client agrees that (a) the quality of the Platform depends on the uploading or other provisioning of the Client Data into the Platform and (b) Axio will not assume any responsibility for, or undertake to verify, the accuracy or completeness of the Client Data entered by Client. Axio reserves the right to modify or discontinue the Platform (in whole or in part) at any time by giving ninety (90) days’ prior written notice to Client, provided that in the event such modification or discontinuance materially reduces the functionality of the Platform used by Client in accordance with this Agreement, Client may terminate this Agreement upon at least fifteen (15) days’ prior written notice to Axio. Axio will not be responsible or liable for any failure in the Platform resulting from or attributable to (a) Client Data or failures to deliver Client Data to Axio, (b) failures in any telecommunications, network or other service or equipment outside of Axio’s facilities, (c) Client’s or any third party’s products, services, negligence, acts or omissions, (d) any force majeure or other cause beyond Axio’s reasonable control, (e) scheduled maintenance in accordance with the terms herein, or (f) unauthorized access, breach of firewalls or other hacking by third parties. Except for the limited rights and licenses expressly granted hereunder, no other license is granted, no other use is permitted and Client (and its licensors) shall retain all rights, title and interest (including all intellectual property and proprietary rights) in and to Client Data. Except for the limited rights and licenses expressly granted hereunder, no other license is granted, no other use is permitted and Axio (and its licensors) shall retain all rights, title and interest (including all intellectual property and proprietary rights) in and to the Platform, all copies, modifications and derivative works thereof, and all Axio trademarks, names, logos, all rights to patent, copyright, trade secret and other proprietary or intellectual property rights. Client agrees that Axio is free to disclose aggregate measures of Platform usage and performance, and to reuse all general knowledge, experience, know­how, works and technologies (including ideas, concepts, processes and techniques) acquired during provision of the Services (“General Knowledge”), including that it could have acquired performing the same or similar services for another client. Client further agrees that Axio shall have the right (a) to create anonymized compilations and analyses of Client Data that is combined with data from numerous other clients (“Aggregate Data”), and (b) to create reports, evaluations, benchmarking tests, studies, analyses and other work product from Aggregate Data (“Analyses”); provided, however, that Client Data does not comprise more than ten percent (10%) of the data used in connection with any single Analysis. Axio shall have exclusive ownership rights to, and the exclusive right to use and distribute, such Aggregate Data and Analyses for any purpose, including, but not limited to advertising, marketing, and promotion of networking opportunities to other clients and prospective clients of the Platform; provided, however, that Axio shall not distribute Aggregate Data and Analyses in a manner that is identifiable as Client Data. All Client (a) suggestions for correction, change or modification to the Platform, (b) evaluation data relating to the Services, (c) benchmark tests of the Services, and (d) other feedback, information and reports provided to Axio hereunder (collectively, “Feedback”), will be the property of Axio and Client shall and hereby does assign any rights in such Feedback to Axio. Client agrees to assist Axio, at Axio’s expense, in obtaining intellectual property protection for such Feedback, as Axio may reasonably request. Except as expressly permitted in this Agreement, Client shall not directly or indirectly (a) use any of Axio’s Confidential Information (defined below) to create any service, software, documentation or data that is similar to any aspect of the Platform, (b) disassemble, decompile, reverse engineer or use any other means to attempt to discover any source code of the Platform, or the underlying ideas, algorithms or trade secrets therein, (c) encumber, sublicense, transfer, rent, lease, time­share or use the Platform in any service bureau arrangement or otherwise for the benefit of any third party, (d) copy, distribute, manufacture, adapt, create derivative works of, translate, localize, port or otherwise modify any aspect of the Platform, (e) use or allow the transmission, transfer, export, re­export or other transfer of any product, technology or information it obtains or learns pursuant to this Agreement (or any direct product thereof) in violation of any export control or other laws and regulations of the United States or any other relevant jurisdiction or (f) permit any third party to engage in any of the foregoing proscribed acts. Each party agrees that the business, technical and financial information, including without limitation, the Platform and Client Data and all software, source code, inventions, algorithms, know­how and ideas and the terms and conditions of this Agreement, that is designated in writing as confidential, or is disclosed in a manner that a reasonable person would understand the confidentiality of the information disclosed, shall be the confidential property of the disclosing party and its licensors (“Confidential Information”). Confidential Information does not include information that (a) is previously rightfully known to the receiving party without restriction on disclosure, (b) is or becomes known to the general public, through no act or omission on the part of the receiving party, (c) is disclosed to the receiving party by a third party without breach of any separate nondisclosure obligation, (d) is independently developed by the receiving party, or (e) constitutes aggregated, anonymized data and information that cannot be re­identified or de­anonymized. Except for the specific rights granted by this Agreement, the receiving party shall not access, use or disclose any of the disclosing party’s Confidential Information without its written consent, and shall use at least the standard of care used to protect its own Confidential Information, but not less than reasonable care to protect the disclosing party’s Confidential Information, including ensuring that its employees and contractors with access to such Confidential Information (a) have a need to know for the purposes of this Agreement and (b) have been apprised of and agree to restrictions at least as protective of the disclosing party’s Confidential Information as this Agreement. Each party shall be responsible for any breach of confidentiality by its employees and contractors. Each party may disclose only the general nature, but not the specific terms, of this Agreement without the prior consent of the other party; provided that either party may provide a copy of this Agreement or otherwise disclose its terms in connection with any legal or regulatory requirement, financing transaction or due diligence inquiry. Nothing herein shall prevent a receiving party from disclosing any Confidential Information as necessary pursuant to any court order, lawful requirement of a governmental agency or when disclosure is required by operation of law (including disclosures pursuant to any applicable securities laws and regulations); provided that prior to any such disclosure, the receiving party shall use reasonable efforts to (a) promptly notify the disclosing party in writing of such requirement to disclose and (b) cooperate with the disclosing party in protecting against or minimizing any such disclosure or obtaining a protective order. Client shall pay to Axio all Fees, in U.S. dollars, in accordance with the terms set forth on the Order Form. Except as expressly set forth herein, all Fees are non­refundable, and all amounts are due and payable upon receipt of the invoice. All payments required by this Agreement are exclusive of federal, state, local and foreign taxes, duties, tariffs, levies, withholdings and similar assessments (including without limitation, sales taxes, use taxes and value added taxes), and Client agrees to bear and be responsible for the payment of all such charges, excluding taxes based upon Axio’s net income. 6. LIMITED WARRANY AND DISCLAIMERS. Each party represents and warrants that (a) it has full power and authority, and has obtained all approvals, permissions and consents necessary, to enter into this Agreement and to perform its obligations hereunder, (b) this Agreement is legally binding upon it and enforceable in accordance with its terms, and (c) the execution, delivery and performance of this Agreement does not and will not conflict with any agreement, instrument, judgment or understanding, oral or written, to which it is a party or by which it may be bound. Client represents and warrants to Axio that Client owns all rights, title and interest in and to the Client Data, or that Client has otherwise secured all necessary rights in the Client Data as may be necessary to permit the access, use and distribution thereof as contemplated by this Agreement. Axio represents and warrants to Client that (a) the Services will be provided in a professional and workmanlike manner and (b) Axio owns all rights, title and interest in and to the Platform, or that Axio has otherwise secured all necessary rights in the Platform as may be necessary to permit the access and use thereof as contemplated by this Agreement. Any warranty claim under this Section 6.3 must be made in writing within thirty (30) days after performance of the nonconforming Services. Axio’s sole obligation and Client’s exclusive remedy in respect thereof is to reperform the nonconforming Services. EXCEPT AS OTHERWISE PROVIDED HEREIN, TO THE FULLEST EXTENT PERMITTED BY LAW, AXIO HEREBY DISCLAIMS (FOR ITSELF AND ITS SUPPLIERS) ALL OTHER WARRANTIES, WHETHER EXPRESS OR IMPLIED, ORAL OR WRITTEN, WITH RESPECT TO THE PLATFORM AND THE SERVICES, INCLUDING, WITHOUT LIMITATION, ALL IMPLIED WARRANTIES OF TITLE, NON­INFRINGEMENT, QUIET ENJOYMENT, INTEGRATION, MERCHANTABILITY OR FITNESS FOR ANY PARTICULAR PURPOSE, RELIABILITY, THAT THEIR OPERATION WILL BE UNINTERRUPTED OR ERROR­FREE AND ALL WARRANTIES ARISING FROM ANY COURSE OF DEALING, COURSE OF PERFORMANCE OR USAGE OF TRADE. Indemnity. Except as provided below, Axio agrees to (i) defend Client against any claim by a third party that the Platform infringes a valid U.S. patent (issued as of the Effective Date), or any copyright or trade secret, of such third party and (ii) indemnify Client for settlement amounts or third party damages, liabilities, costs and expenses (including reasonable attorneys’ fees) awarded and arising out of such claim. If any part of the Platform becomes or, in Axio’s opinion, is likely to become the subject of any injunction preventing its use as contemplated herein, Axio may, at its option (1) obtain for Client the right to continue using the Platform or (2) replace or modify the Platform so that such services become non­infringing without substantially compromising their principal functions. If (1) and (2) are not reasonably available to Axio, then Axio may (3) terminate this Agreement upon written notice to Client. Fees that were pre­paid for the current term are non­refundable. The foregoing states the entire liability of Axio, and Client’s exclusive remedy, with respect to any actual or alleged violation of intellectual property rights by the Platform, any part thereof or its use or operation. b. Exclusions. Axio shall have no liability or obligation hereunder with respect to any claim to the extent based upon (i) any use of the Platform not strictly in accordance with this Agreement or in an application or environment or on a platform or with devices for which it was not designed or contemplated, (ii) modifications, alterations, combinations or enhancements of the Platform not created by or for Axio, (iii) any Client Data, (iv) any portion of the Platform that implements Client’s requirements, (v) Client’s continuing allegedly infringing activity after being notified thereof or (vi) Client’s continuing use of any version of the Platform after being provided modifications that would have avoided the alleged infringement. Client agrees to defend Axio against any claim by a third party that is related to (a) Axio’s authorized use of any Client Data, or (b) claims excluded under Section 7.1(b), and to indemnify Axio for settlement amounts or damages, liabilities, costs and expenses (including reasonable attorneys’ fees) awarded and arising out of such claims. Any claim for indemnification hereunder requires that (a) the indemnified party provides prompt written notice of the claim and reasonable cooperation, information, and assistance in connection therewith, and (b) the indemnifying party shall have sole control and authority to defend, settle or compromise such claim. The indemnifying party shall not make any settlement that requires a materially adverse act or admission by the indemnified party without the indemnified party’s written consent (such consent not to be unreasonably delayed, conditioned or withheld). The indemnifying party shall not be liable for any settlement made without its prior written consent. EXCEPT FOR ANY BREACH OF SECTION 4 (CONFIDENTIALITY) OR LIABILITIES TO THIRD PARTIES PURSUANT TO SECTION 7 (INDEMNIFICATION), IN NO EVENT SHALL EITHER PARTY BE LIABLE CONCERNING THE SUBJECT MATTER OF THIS AGREEMENT, REGARDLESS OF THE FORM OF ANY CLAIM OR ACTION (WHETHER IN CONTRACT, NEGLIGENCE, STRICT LIABILITY OR OTHERWISE), FOR ANY (A) INTERRUPTION OF USE, LOSS OR INACCURACY OF DATA, LOSS OF, OR COST OF PROCURING SUBSTITUTE TECHNOLOGY, GOODS OR SERVICES, (B) INDIRECT, PUNITIVE, INCIDENTAL, RELIANCE, SPECIAL, EXEMPLARY OR CONSEQUENTIAL DAMAGES INCLUDING, BUT NOT LIMITED TO, LOSS OF BUSINESS, REVENUES, PROFITS AND GOODWILL OR (C) DAMAGES, IN THE AGGREGATE, IN EXCESS OF THE GREATER OF (I) THE AMOUNTS PAID TO IT (IN THE CASE OF AXIO) OR PAID AND PAYABLE BY IT (IN THE CASE OF CLIENT) HEREUNDER DURING THE PREVIOUS TWELVE (12) MONTHS OR (II) $10,000, EVEN IF IT HAS BEEN ADVISED OF THE POSSIBILITY OF SUCH DAMAGES. THESE LIMITATIONS ARE INDEPENDENT FROM ALL OTHER PROVISIONS OF THIS AGREEMENT AND SHALL APPLY NOTWITHSTANDING THE FAILURE OF ANY REMEDY PROVIDED HEREIN. This Agreement shall commence on the date the Order Form is executed by both parties and, unless earlier terminated as provided herein, shall continue for the Term indicated on the Order Form. This Agreement may be earlier terminated by either party (a) if the other party materially breaches a provision of this Agreement and fails to cure such breach within fifteen (15) days after receiving written notice of such breach from the non­breaching party, or (b) immediately upon written notice, if the other party makes any assignment for the benefit of creditors, or a receiver, trustee in bankruptcy or similar officer is appointed to take charge of any or all of the other party’s property, or the other party seeks protection under any bankruptcy, receivership, trust deed, creditors arrangement, composition or comparable proceeding or such a proceeding is instituted against the other party and is not dismissed within ninety (90) days, or the other party becomes insolvent or, without a successor, dissolves, liquidates or otherwise fails to operate in the ordinary course. Upon any expiration or termination of this Agreement, all corresponding rights, obligations and licenses of the parties shall cease, except that (a) all obligations that accrued prior to the effective date of termination (including without limitation, all payment obligations) shall survive and (b) the provisions of Sections 1 (Definitions), 3 (Proprietary Rights), 4 (Confidentiality), 6 (Limited Warranty and Disclaimers), 7 (Indemnification), 8 (Limitation of Liability), 10 (General Provisions) and this Section 9.3 (Effects of Termination) shall survive. This Agreement constitutes the entire agreement, and supersedes all prior negotiations, understandings or agreements (oral or written), between the parties regarding the subject matter of this Agreement (and all past dealing or industry custom). Any inconsistent or additional terms on any related purchase order, confirmation or similar form, even if signed by the parties hereafter, shall have no effect under this Agreement. This Agreement may be executed in one or more counterparts, each of which shall be an original, but taken together constituting one and the same instrument. Execution of a facsimile (e.g., .pdf or electronic signature) copy shall have the same force and effect as execution of an original, and a facsimile signature shall be deemed an original and valid signature. No change, consent or waiver under this Agreement will be binding on Axio unless made in writing and physically signed by an authorized representative of Axio. The failure of either party to enforce its rights under this Agreement at any time for any period will not be construed as a waiver of such rights, and the exercise of one right or remedy will not be deemed a waiver of any other right or remedy. If any provision of this Agreement is determined to be illegal or unenforceable, that provision will be limited or eliminated to the minimum extent necessary so that this Agreement will otherwise remain in full force and effect and enforceable. This Agreement shall be governed by and construed under the laws of the State of New York and the United States without regard to conflicts of laws provisions thereof. Exclusive jurisdiction and venue for actions related to this Agreement will be the state and federal courts located in New York County, New York, and both parties consent to the jurisdiction of such courts with respect to any such actions. Except as specifically provided otherwise herein, each right and remedy in this Agreement is in addition to any other right or remedy, at law or in equity. Each party agrees that, in the event of any breach or threatened breach of Section 3 (Proprietary Rights) or 4 (Confidentiality), the non­breaching party will suffer irreparable damage for which it will have no adequate remedy at law. Accordingly, the non­breaching party shall be entitled to injunctive and other equitable remedies to prevent or restrain such breach or threatened breach, without the necessity of posting any bond. Except as otherwise provided herein, all notices under this Agreement will be in writing, in English and delivered to the parties at their respective addresses stated herein or at such other address designated by written notice. Notices will be deemed to have been duly given when received, if personally delivered; when receipt is electronically confirmed, if transmitted by facsimile; the day after being sent, if sent for next day delivery by recognized overnight delivery service; or upon receipt, if sent by certified or registered mail, return receipt requested. In the event that either party is prevented from performing, or is unable to perform, any of its obligations under this Agreement (except payment obligations) due to any cause beyond its reasonable control, the affected party shall use commercially reasonable efforts to give written notice thereof to the other party and its performance shall be extended for the period of delay or inability to perform due to such occurrence. This Agreement and the rights and obligations hereunder may not be assigned, in whole or in part, by either party without the other party’s written consent, not to be unreasonably withheld. However, without consent, either party may assign this Agreement to any successor to all or substantially all of its business which concerns this Agreement (whether by sale of assets or equity, merger, consolidation or otherwise). This Agreement shall be binding upon, and inure to the benefit of, the successors, representatives and permitted assigns of the parties hereto.